The Grove by Rockwell | +639178132871 | Inquire Now! Own Your Grove Unit. 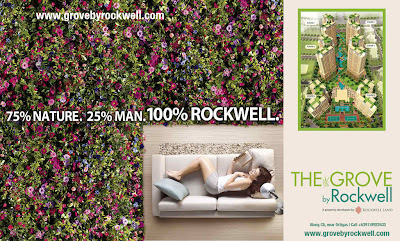 : 100% Rockwell - The Grove by Rockwell. 100% Rockwell - The Grove by Rockwell. The Grove by Rockwell is set to be the most fashionable address in Ortigas. Experience the difference of uncrowded lush gardens. The Grove by Rockwell boasts a 75-25 % outdoor indoor ratio. Come home to everything. The Grove by Rockwell stands a head above the rest with its amenities exclusive to residents. Enjoy the premium quality living found in Rockwell Center , from 1 to 3 bedroom flats and to the coveted Garden Units. A two story retail area housing your favorite restaurants. Everything is always just a stone's throw away. Located near private schools, the Ortigas business district, a premiere Medical Center and exclusive subdivisions.